Pico Deals:Looking for a better deal?, look at the standard version by clicking here for our best priced models. Pairing:Pico is unassigned out of the box, and requires a simple pairing process to link or marry it to a compatible device. There are a couple models of Pico offered at exceptional price, they are the most common, and the ones Lutorn and Hanks stocks, this is not that collection, you can find those by clicking here. This is all the other variations of labeling and colors. If you can use a more standardized model check out our special Pico Deals by clicking here. Have you ever had a pocket door where you needed a switch? Kitchen Island? Or next to your favorite chair? There you go. How about removing back splash clutter and hiding this under the cabinet. Someone installed only one switch where you should really have a 3-way, how about turning on a garage light before you go into the garage? Have you ever seem where a sadistic electrician placed switches on both sides of a door? 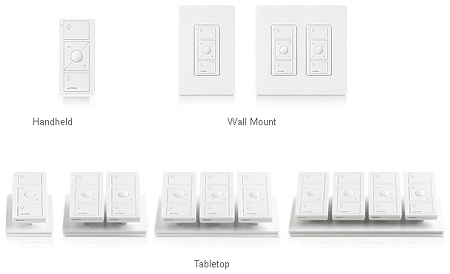 Replace one with Maestro Wireless device and the other side add a Pico without cutting up the wall, just mount it adjacent to the switch a replace the single plate with a double. Don't forget there are a couple of plug-in options for switching or dimming of table and floor lamps or small appliances. Pico Battery Operated Control works universally in the Maestro Wireless, Caseta, Radio Ra 2, Power Savr Node, Lutron wireless shades and some of their other systems. The biggest question is always battery life. The battery lasts and extremely long time but it will depend on use. The latest Pico version claims 10year battery life, I have a heavily used one in my main bathroom going on 3 years with the original battery. Some of the original Picos only got 3-5 years. There is a nightlight version, which will reduce your battery life as well. Regardless, the battery is simple to change and commonly available (CR2032). Wall Mount Adapter, especially handy in any application you will mount a wallplate around the Pico to make it look like a regular switch, required if mounting to a switch box. You can mount on any flat surface with the provided self adhesive strip, the supplied battery cover also has screw holes for mounting, however if you plan to mount a wallplate the adapter has the wallplate mounting you will want. Car Visor Clip, it's name is a dead giveaway, but you could use it to clip on to any thin surface or if you need a mobile solution clip it on your belt. Remember the range on the Pico is a conservative 30ft but depending on the system and the mounting of the receiving unit it may only operate immediately in front of you home or in your driveway. Weighted Pedestal. These look a little odd, but present the Pico in an easy to operate manner, have a weight base so they are not easily toppled, also they are less likely to get swept away or between the couch cushions if you are not going to mount it. Maestro Wireless: Up to 10 devices in the Maestro Wireless Family may be connected. 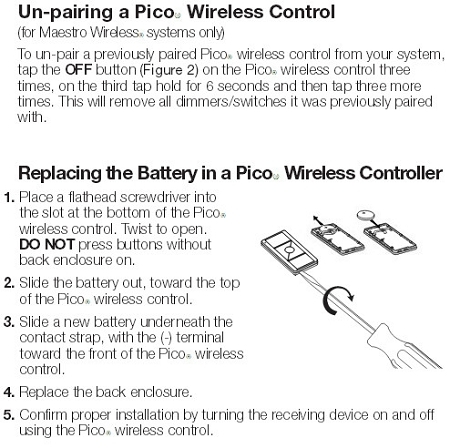 So use 9 Picos and 1 Maestro Wireless device or just the opposite, or any combination thereof. The 10 device limit only pertains to those talking to each other. If you have a Pico/Maestro pair in one room and another set in a different room you don't have to add them unless you want to control them all together from a common Pico or from both. 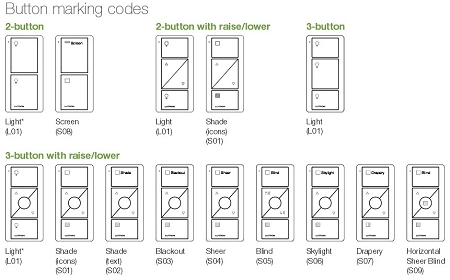 If you need individual control of multiple dimmers(or switches) you will need a Pico for each. Caseta: The Pico is integral to the Caseta system. As a limited system there are only a few components and the Pico is luckily one. 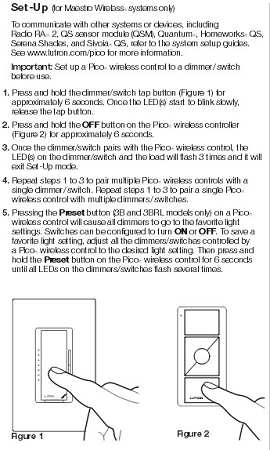 If you need to replace a wired 3-way or 4-way with Caseta you'll need some Pico's. They program easily in the APP, but keep in mind Range is 30ft and it's easy to get carried away with Caseta, but there is no additional repeaters. It's really intended for room, small home, studio or condo. If you have >1000sqft you should really consider Radio Ra 2.